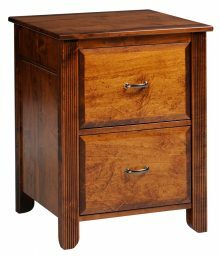 A gorgeous solid wood Amish File Cabinet can help you organize your home office, while also dramatically improving its appearance. We offer more than 150 handsome file cabinets in a wide range of shapes, sizes and styles. You’ll find everything from compact two-door file cabinets that allow you to make the most of limited space to larger credenzas with hutches – and everything in between! With so many choices, you don’t have to settle for a “standard,” mass-produced filing cabinet produced on an assembly line. You can pick the size, style, features and finish that satisfy all of your file storage needs. Our solid Amish filing cabinets are heavy and sturdy and won’t move around when you open and close drawers. Flimsy metal or particle board filing cabinets don’t stay put, and don’t do as good a job protecting your important documents and files. Thanks to our wide range of multi-drawer filing cabinets, it’s possible to find one for every space. Your office, your den, your bedroom — wherever you would like to store and file your important documents. You might want one of our smaller models to slide under a desk, or you might need more filing space and instead choose one of our larger models with four, six or even 10 drawers. Some models mix multiple storage solutions like drawers, shelves and glass-front cabinets in one handy unit. While you might be tempted to economize by purchasing bargain-priced office furniture at your local discount office furniture store, you’ll likely end up with a poor-quality product that won’t hold up for long. Our file cabinets are handcrafted from your choice of solid, attractive northern kiln-dried hardwoods such as oak, cherry, rustic cherry and maple – sturdy materials that always stand the test of time. Skilled Amish crafters make each file cabinet, one at a time, paying close attention to the smallest details. You’ll get a one-of-a-kind product you’ll be happy to have in your home office for years to come. Quite often, mass-produced filing cabinets are flimsy and unattractive, so you want to hide them away. 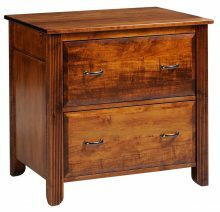 With a solid wood Amish filing cabinet, you’ll want to show it off! Designed with the same style, quality and finish as other Amish furniture, our filing cabinets look right at home alongside your other furniture. and because many are part of large home furnishing collections, they can be coordinated perfectly with other furniture from our Amish collection. Business owners want exceptional value in their furniture. They invest in pieces they know will last a long time. They appreciate the value of well-made furniture crafted out of the finest materials. That’s why many businesses buy our Amish filing cabinets. They make fine additions to any workspace. You know they offer the longevity you need along with the organizational assistance your employees desire. Adding functional, attractive cabinets to your space can improve the tidiness of your office and also ensure you keep track of your most important documents. You can opt for big cabinets or small ones that can fit beneath your employees’ desks. You might even choose a filing cabinet with a built-in bookshelf to add even more storage space to your office. We provide many benefits to buying from AmishOutletStore.com. We have bulk ordering options that can save you money when you purchase cabinets and other furniture for your office. Our extensive lineup of furniture includes many other items you may want for your office, such as desks, chairs and printer stands. A polished, professional office with matching furniture will impress your clients and delight your employees. Why Buy AmishOutletStore.com Filing Cabinets? When you place large orders, we can even offer up to 13% savings! Pick a filing cabinet for every member of your family so that everyone can get organized. 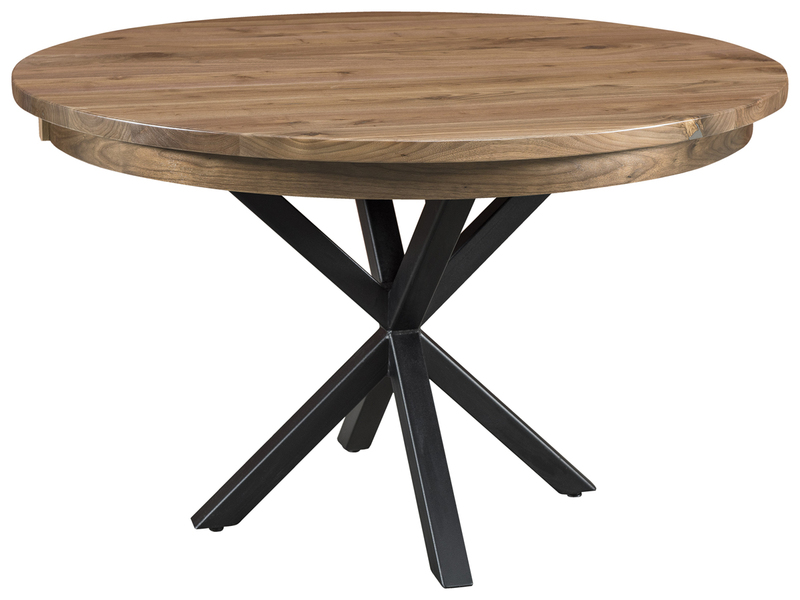 The designs are so attractive and elegant that they even make great side tables or end tables if you don’t have a lot of space in your home and want to combine functionality. Only northern kiln-dried wood is selected for your cabinet, with special attention paid to the beauty and pattern of the natural grain. Traditional Amish woodworking and fastening methods are used when creating the pieces and joining them, along with quality hardware and accessories. 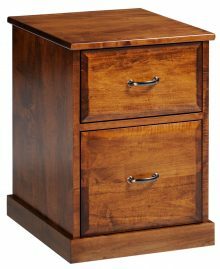 Your solid wood filing cabinet is finished with a beautiful and durable stain of your choosing, allowing for true customization according to your style and décor. These elements combine to turn your filing cabinet from a simple piece of office furniture into a lovely item worthy of the legendary Amish name. Artisans will pour their know-how and attention into your solid wood cabinet because they know they are creating it according to your wishes. These aren’t workers churning out identical copy after identical copy: These are true craftsmen applying generations of experience the way their fathers and grandfathers taught them. You can save money when you purchase your file cabinet from AmishOutletStore.com. We’ll give you up to 33% off the regular retail price on any file cabinet in our collection if you place your order today. Discounts are also available for large orders and when paying by check. When you choose your solid wood filing cabinet, you can also choose pieces from our other home furnishing collections, including desks, chairs and bookcases for your office. Take advantage of our offers and save big money when you select a full set off office furniture. You’ll be able to customize your filing cabinet and other furniture with many great wood and stain options, allowing you to suit any type of décor. 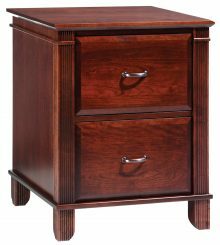 Take a moment to browse our huge selection of handcrafted solid wood Amish File Cabinets and order yours today!